TORONTO — Got a question? Forget Siri or Alexa, call 211. Try 211 out and see if they can answer your questions. If they can’t answer they will refer you to the right person or party who can. 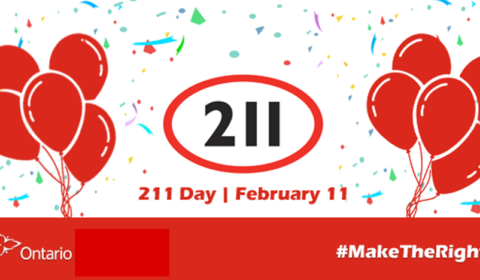 To mark this day, Community Connection/211 Central East and the 211 Ontario network are asking residents to make the right call if they want or need non-emergency help by dialing 2-1-1. You can ask who do you call about almost anything, from sidewalk snowplowing, to how to speak to your MP or MPP, or how to get a doctor. Your list of questions can be endless. How do I get a subscription to ,,, MuskokaTODAY? Today, 211 also launched the ability to chat with a 211 Community Navigator online atwww.211ontario.ca. Knowing the right number to call or chat with will help people find the right programs and services for their situation and reduce non-urgent calls to 911. Residents should always call 9-1-1 for a life-threatening emergency, when a property is in danger or a crime is in progress that requires the police, fire or paramedics. 211 is a valuable resource for residents. Sometimes 911 communications receive calls about issues that aren’t emergency related such as landlord disputes, consumer complaints or legal problems. By calling 211, residents can find the government or community service that can help them navigate these challenges. “211 works closely with Emergency Responders and other front-line workers to alleviate the burden of misdirected or inappropriate calls to 911, ensuring emergency personnel can focus on dealing with the immediate crisis,” said Pamela Hillier, Executive Director, Community Connection/211 Central East. 211 provides an online searchable database, and a 24/7 helpline to support front-line responders in connecting people to the longer-term and community-based supports they may need. Navigating health, government, housing, legal & public safety services and finding the right helpline or information service were the top five reasons for calling 211 in 2018. Dialing 2-1-1, a three-digit number, or chatting online with 211 at www.211ontario.ca, connects residents to the 211 helpline to find help for life’s twists and turns. 211 is a helpline available by phone, chat or online search that helps Ontario residents navigate the complex network of government, health, community and social service quickly and easily, 24 hours a day, 365 days a year, with interpretation in over 150 languages. 211 is supported by the Province of Ontario, United Ways and some municipalities across the province.